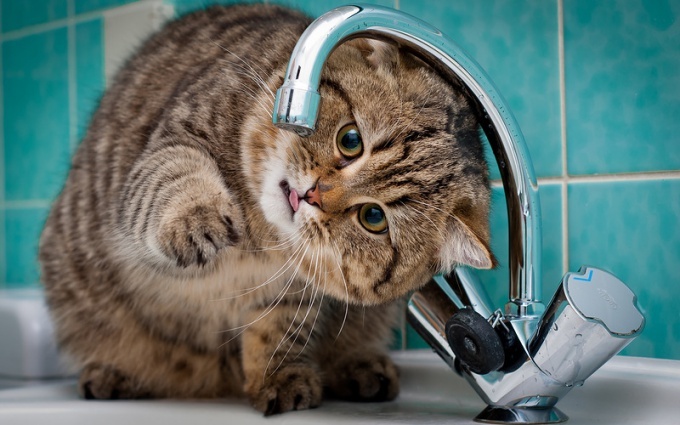 Water is necessary for every living organism, and cats are no exception. However, despite all the efforts of the owners to comply with the rules on the amount of drinking, the animal may still receive less liquid. The fact that there are cats who themselves drink little. If the cat does not drink water in sufficient quantity, on the one hand, it allows the body to conserve water by a strong concentration of urine, on the other hand, can result in serious health problems. if the cat eats dry food, she should drink 2-3 times more water than the amount eaten per day of dry food. Watch your favorite first. Perhaps the little cat drinking from the bowl or even it doesn't, because it's drinking water from the tap, some kind of vase or jug. Put in different places of the apartment water containers of different sizes and colors – mugs, cups, saucers. should daily wash the dishes for drinking with soap or in the dishwasher. Encourage your pet, praise and pet, call to drink, slightly dampening his paws and the tip of the nose. Put in the water of his favorite toys to your pet in the process of drinking was associated with something pleasant and positive. In a pinch add water to normal with a syringe, injecting it in the corner of his mouth. Daily do this process and every time after praising their favorite. To be able to understand, whether enough water is consumed by your cat, gently gather in the hand of her skin in the blades, like you're going to raise the pet by the collar, and then release. If the skin is cracked quickly, then everything is fine. If the skin first, some time is a stake, and then slowly straightened, it is a sign of health problems. In this case, it is recommended to examine the animal for signs of kidney stones.